I made a cellular automaton rule that roughly simulates Turing Tumble! It is written as a .rule file that can be used with the free program Golly. 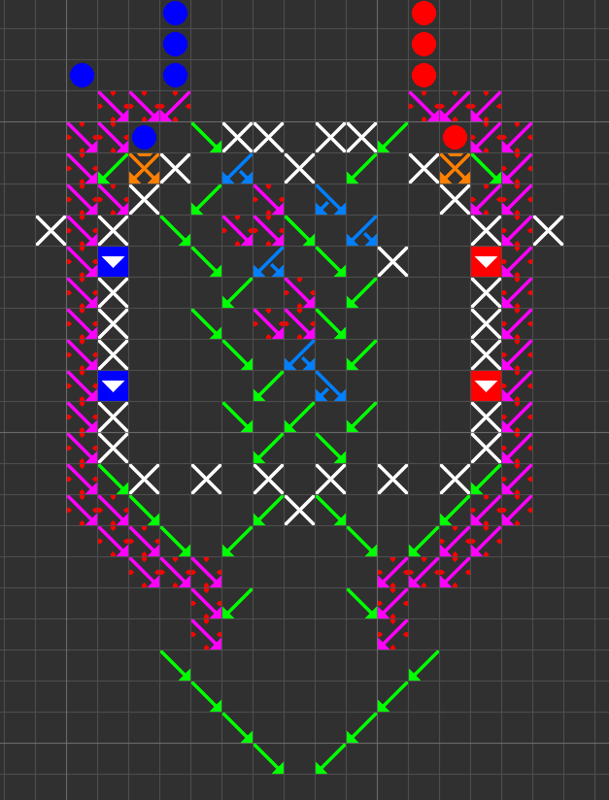 Golly’s canvas is infinite, so there is no maximum board size. In fact, you can even have multiple boards. There is a limited ability to handle multiple marbles. This is used in the construction of the board shown above. However, if two marbles try to roll into the same space at the same time, one of them will be annihilated. Crossovers secretly double as marble sorters. If you place a marble on top of a crossover, then matching marbles will be reflected instead of being allowed to cross. Due to the “speed of light” of 1 cell per tick, blocks of gearbits may not be simulated properly. The gearbit change can only propogate at the same speed as the marbles, so the marbles can sometimes outrun the change. There are no gears, only gearbits. Not like it matters very much. Wow this is very cool! It will take a while to remember the symbols, but this will be much faster than TT.